Clearwater, FL., November 15, 2014 – In a see-saw battle that had multiple lead changes and came down to the wire, having a four-time MLB all-star and Silver Slugger award winner can make all the difference. Only this time, it wasn’t just with his bat. Former Colorado Rockies star Dante Bichette finished 3-for-4 with a trio of singles and the game-tying RBI, but was even more impressive on the mound, tossing 4-2/3 innings and allowing just a single run to give Cardinals manager David Hash another Fall Classic championship. Thanks to a late rally, it never came to that. After taking a quick 4-0 lead, the Cardinals found themselves behind 7-5 and just seven outs from defeat. But when Curtis Patterson and Bichette each drove in runs with two-out hits, East Coast had tied the game and set the stage for the fateful eighth. A base on balls and a pair of infield errors, one throwing and one fielding, allowed the go-ahead run to score. And when Bichette worked around a two-out double in the ninth to induce a game-ending pop-out, another title was clinched. 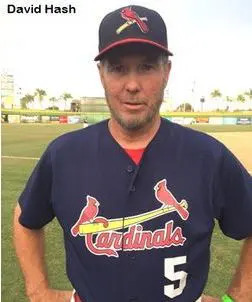 The victory capped a stellar week for the East Coast Cardinals, who finished round-robin play 4-1, including an 8-3 victory over Chester County. Dennis Gawronski’s complete game effort proved the difference in a 10-5 playoff victory over the Maryland Monarchs to set the stage for the thrilling championship game. For the Cobras, a 3-2 round robin effort was capped with a dominant 5-0 playoff victory over the Brooklyn Royals. It looked like Chester County would continue that momentum to a tournament championship when it scored five runs in the third and single runs in the fifth and seventh to take a 7-4 lead. But it wasn’t meant to be. It marked the second loss to the Cardinals in a Fall Classic title game, the other coming following the 2008 tournament. “Despite the errors late, we can’t say we handed them anything,” said Chester County manager Pete Alex. “To have a man on second base with a chance to tie it in the ninth is a credit to our guys who never gave up.